It may start to feel like everyone is talking about Making Tax Digital at the moment. However, it is a really important thing for all business owners to be aware of as it will affect every business owner and every business. In this blog post we thought we would talk about the four foundations of Making Tax Digital. To enable you to gain a better understanding of why it was introduced and what it will achieve. Making Tax Digital means that organisations will be able to see the information that is held by the HMRC. These organisations will also be able to check if the details they have entered are complete, up to date and correct. HMRC will then be able to use this information to tailor the services it offers customers. This will be according to their individual circumstances. With Making Tax Digital, organisations will no longer have to wait until the end of the year, or longer, to find out how much tax they should pay. Instead HMRC will collect and process the information that affects tax as close to real time as possible. This will help prevent errors and stop tax due or repayments owed building up. This should make paying tax easier for business owners. It is planned that by 2020, HMRC customers will be able to clearly see a comprehensives financial picture in their digital account. This will be very similar to the financial picture they can see through their online banking. This should make it easier for business owners to review their business financially and make better informed financial decisions. HMRC customers will be able to interact digitally with HMRC staff on days and times that suit them. Digital record keeping software will also be linked directly to HMRC. This will allow business owners to easily send and receive information to HMRC from their own software as and when it suits them. If you have concerns about Making Tax Digital or would rather bury your head in the sand, then why not contact us now. We can help you understand Making Tax Digital and take away that stress and worry for you. 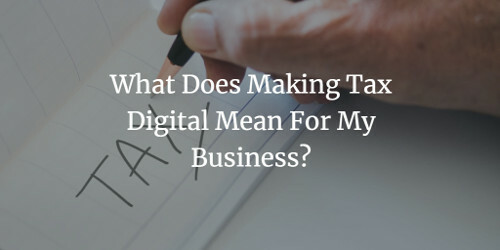 What Does Making Tax Digital Mean For My Business? Unless you have been living under a rock, you will have heard about Making Tax Digital by now. From April this year the government has begun live testing of the system and from April 2019 Making Tax Digital will force businesses, which are above the £85,000 VAT registration, threshold to keep all records necessary for VAT purposes online. So what does Making Tax Digital mean for your business? Making Tax Digital allows small to medium business owners to keep online records of their income and expenditure for Income Tax purposes and send quarterly updates of this to HMRC via their payment software app. If you are a business that is currently keeping your records in a cashbook, on a spreadsheet or on non-Making Tax Digital-compliant software then you will need to make changes. As of April 2019 you will need to change your systems and processes because you will no longer be able to log-in to HMRCs website and key in your VAT return figures. When should I get everything in place for Making Tax Digital? While many businesses are holding out until the last minute, we would highly recommend that you do not wait for Making Tax Digital to apply legally for your business, but instead voluntarily comply with Making Tax Digital for your VAT so you are ready and prepared for when it does become a legal requirement for your business. By getting ahead of the Making Tax Digital deadlines you have the time to change your bookkeeping processes and also get to grips with using the new software. If you choose to change to Xero we would be happy to help you move the business across and we can train you and your team so you can get the most from the Xero system. Changing accounting software can be tricky so to avoid last minute rushes, panics and headaches we would recommend that you give yourself plenty of time to plan for Making Tax Digital, because April 2019 will be here before you know it. For a free report on what you need to do to comply with Making Tax Digital rules, please click the button below to get a free report.